FORT WORTH, Texas, February 20, 2019 – BNSF Railway Company (BNSF) today announced that its 2019 capital expenditure and maintenance program in Texas will be approximately $405 million. More than half of this year’s capital plan in the Lone Star State is allocated for expansion projects aimed at enhancing capacity and fluidity along the network. The remainder of this year’s spend in Texas will be for maintenance aimed at ensuring BNSF continues to operate a safe and reliable rail network. Capital expansion projects in the state include beginning a new double track project between the Alliance Intermodal Facility in Fort Worth and Cleburne and two new siding projects on the Madill Subdivision north of Dallas. Centralized Traffic Control will also be installed along the same stretch of the Madill Subdivision. At our Eagle Pass Border Gateway, new staging tracks are planned to handle growth into Mexico. A multi-year facility expansion project is slated for the Alliance Intermodal Facility, which includes the construction of new production tracks and incremental parking stalls as well as acquiring lift equipment. Over the past five years, BNSF has invested more than $1.8 billion to expand and maintain its network in Texas. 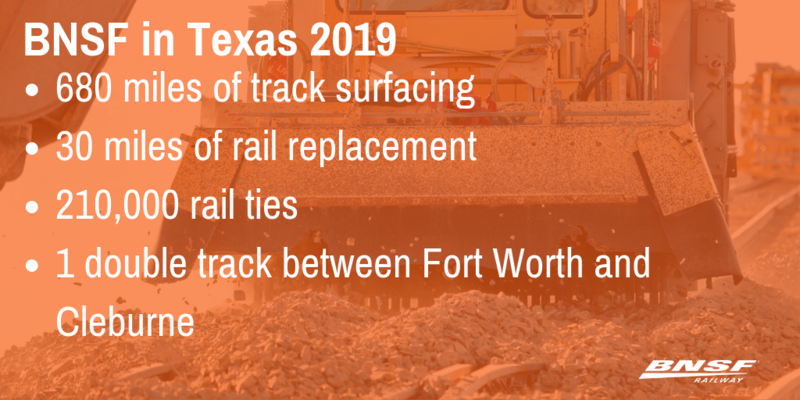 This year, the maintenance program in Texas includes approximately 680 miles of track surfacing and/or undercutting work as well as the replacement of nearly 30 miles of rail and close to 210,000 ties.